The combination of butter, lemon, and vanilla is one of the most glorious ones in cake realm. This soft, velvety, tender, and lofty cake is contrasted by a crunchy crust and crisp, classic lemon sugar glaze. This is my favorite of all lemon cakes. Baked in two smaller pans (see Make This Recipe Your Own, page 110), it makes terrific holiday gifts. PLAN AHEAD: For best flavor and texture, bake and syrup the cake 1 day ahead. BAKING EQUIPMENT: The pan must be a minimum of 14 cup capacity such as a Nordic Ware Anniversary Bundt Pan with 10 to 15 cup capacity (or use a 12 cup Bundt pan and bake the extra batter as 4 cupcakes). Coat the pan with baking spray with flour. Do not use an angel food pan, because the cake will break apart when unmolding it. → The ratio of white to yolk in an egg can vary to such a degree that you may need as few as 7 or as many as 11 eggs for this recipe. It is therefore advisable to weigh or measure the separated yolks and add or reduce if needed. → The butter smooths the texture of the lemon glaze. → ½ teaspoon (2.5 ml) high-quality lemon oil such as Boyajian, added with the vanilla to the cake, can be substituted for the lemon zest. → To bake as two baby cakes, you will need two 6 cup Bundt pans or two 8½ by 4½ inch loaf pans, lightly coated with baking spray with flour. Divide the batter between the two pans, filling them about 1 inch from the top (640 grams each). Bake for 40 to 45 minutes. The batter will rise about ¼ inch above the rims but will be level on cooling. Cool for 10 minutes before unmolding. Twenty minutes or longer before baking, set an oven rack in the lower third of the oven. Set the oven at 350ºF/175ºC. Thirty minutes to 1 hour ahead, set the butter and eggs on the counter at room temperature (65º to 75ºF/19º to 24ºC). With dish washing liquid, wash the lemons. Rinse, dry, and zest them. Into a 2 cup measure with a spout, weigh or measure the egg yolks. Add 60 grams/¼ cup of the sour cream and the vanilla, and whisk lightly until combined. In the bowl of a stand mixer fitted with the flat beater, add the flour, sugar, baking powder, baking soda, salt, and lemon zest and mix on low speed for 30 seconds. Add the butter and the remaining 182 grams/¾ cup sour cream. Mix on low speed until the flour mixture is moistened. Raise the speed to medium and beat for 1½ minutes to aerate and develop the cake’s structure. The mixture will lighten in color and texture. Scrape down the sides. Starting on low speed, gradually add the egg mixture in two parts, beating on medium speed for 30 seconds after each addition to incorporate the ingredients smoothly. Bake for 45 to 55 minutes (15 to 20 minutes for the cupcakes), or until a wire cake tester inserted near the center comes out clean and the cake springs back when pressed. The cake should start to shrink from the sides of the pan only after removal from the oven. In a small pan over medium heat, stir the lemon juice and sugar until dissolved. Cover it and set it aside. As soon as the cake comes out of the oven, place the pan on a rack, poke the cake all over with a wire cake tester, and brush it with about one-third (66 grams/50 ml) of the syrup. Cool the cake in the pan for 15 minutes. Invert the cake onto a serving plate. Brush the top and sides of the cake with the remaining syrup. Cool completely and then cover with plastic wrap. At least 1 hour before serving, apply the lemon glaze. Into a small bowl, sift the powdered sugar. Add the lemon juice and stir until all the sugar is moistened. Stir in the butter. Whisk the glaze until completely smooth. When you lift the whisk, the mixture should drop thickly and pool for a few seconds before disappearing smoothly into the surface. If necessary, add more lemon juice by the drop to thin the glaze. If the glaze is too thin, whisk in more powdered sugar. Cover if not using at once. 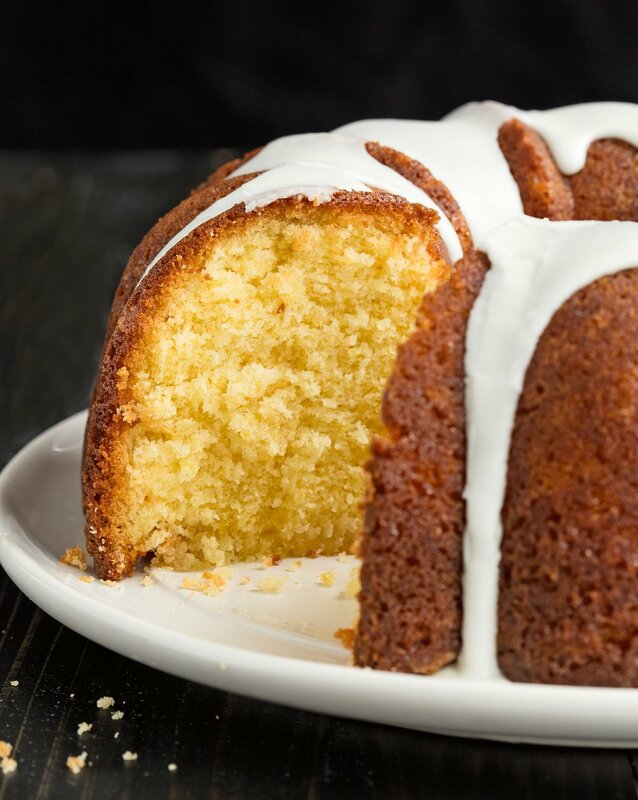 Use a teaspoon to drizzle the glaze onto the cake. You can also pipe the glaze, or even pour it over the top, allowing it to cascade down the sides. •	The ratio of white to yolk in an egg can vary to such a degree that you may need as few as 7 or as many as 11 eggs for this recipe. It is therefore advisable to weigh or measure the separated yolks and add or reduce if needed. •	The butter smooths the texture of the lemon glaze. •	½ teaspoon (2.5 ml) high-quality lemon oil such as Boyajian, added with the vanilla to the cake, can be substituted for the lemon zest. •	To bake as two baby cakes, you will need two 6 cup Bundt pans or two 8½ by 4½ inch loaf pans, lightly coated with baking spray with flour. Divide the batter between the two pans, filling them about 1 inch from the top (640 grams each). Bake for 40 to 45 minutes. The batter will rise about ¼ inch above the rims but will be level on cooling. Cool for 10 minutes before unmolding. TRIPLE LEMON VELVET BUNDT CAKE is excerpted from Rose’s Baking Basics © 2018 by Rose Levy Beranbaum. Photography © 2018 by Matthew Septimus. Reproduced by permission of Houghton Mifflin Harcourt. All rights reserved.